Do You Take Bacon Fat With Your Coffee? I discovered recently that there are a number of ways to have your coffee. There is, of course, black (no sugar, no milk); light and sweet (lots of sugar and milk); or some combination that excludes one or the other or substitutes sugar with an artificial sweetener or substitutes milk with cream. But did you know that you can add bacon fat to your coffee? But I sincerely do not recommend it. My wife buys local jars of honey and uses a teaspoon every morning with her tea (and has convinced me of the virtues of using it in my coffee instead of sugar). The jars are pretty large and when they are empty can be useful for assorted purposes, including collecting cooking fat so we don’t pour it down the drain and clog up the works. I get in from work pretty late, often around 2:30 a.m., so when I stagger out of bed in the morning, I am looking for coffee — stat! On this particular morning, there were two honey jars, one filled three-quarters with yummy nature’s goodness — honey — and the other coated at the bottom with congealed bacon fat. So there is a 50-50 chance of picking the correct jar. Not only did I pick the wrong one, but I actually had to work at it reaching deep into the jar to scrape out what I thought was honey. Now, you may smartly ask: Given that there were two jars, and one appeared to be nearly empty, what made you think it was filled with honey? The answer is: I am an idiot. 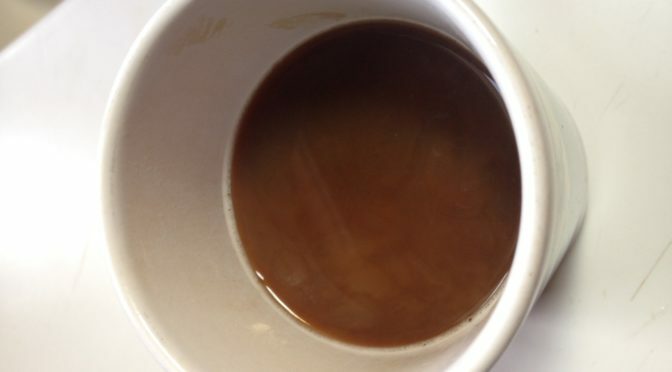 Now that we have gotten that out of the way, let me continue my story: I take a heaping spoon of gunk, put the spoon into my coffee and stir it. At the breakfast table, without giving the mug a second look, I proceed to sip the coffee. Are you familiar with the term “spit take”? It is a comic move in which a character is drinking something and hears some news that is so shocking that they dramatically spray a mouthful of what they are drinking in a gesture of surprise. Well, my reaction was akin to that but involved much more swearing. When I looked at the amoeba-shaped sheen floating on the surface of the coffee, I knew in an instant what had happened. Since this revolting experience, I have learned that other popular additives used around the world are butter, salt and cinnamon. I haven’t tried those yet but it’s hard to imagine anything more disgusting than bacon fat. Oh wait. Yes there is. This happened 30 years ago. My future first wife and my future father-in-law (a big imposing figure of a man) and I were out at an Italian restaurant discussing the upcoming wedding plans. Dessert and coffee were served and I’m so nervous about my future father-in-law, I’m not paying attention to what I’m adding to my coffee. I thought it was sugar. It was in the same metal container that I thought contained sugar. It turned out it was Parmesan cheese. You know, drinking just black coffee has become more and more appealing.